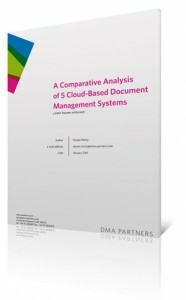 I’ve recently written a whitepaper on online document management systems. It’s intended to help IT decision makers choose the right system. An online DMS can be great if you just want to try document management without committing any internal resources at this point in time. You may find it does exactly what you need it to do or you may find it falls short and you need something more powerful. Either way, you’ve got very little to lose. Download the Online DMS whitepaper here.